The upsurge of people traveling the world by air has resulted in the challenges associated with bedbugs growing accordingly. The costs incurred in elimination, compensation to those affected and damage to your reputation all attack the bottom line. Catching the problem early not only lowers the cost in treatment but increases the treatment success. A reputation of having bedbugs can be gained overnight, with its removal taking months, even years. Cimex lectularius are bugs in the true sense of the word and belong to the Cimicidae family - those which feed solely on blood from a vertebrate host, (human in this case), in order to develop between their life stages and to reproduce. They travel the world by hitching a free ride in the clothing, towels, coats and bags of the traveller and on arrival at the next hotel, leave their temporary “host” and start breeding. Whilst bedbugs prefer to feed at night, they are highly adaptable and will learn to feed from their host during the day if the environment allows - a sofa, a chair, a bed, a seat on the bus or such like. People will react differently to a bite from a bedbug - from swollen, red lumps or blisters on the skin, to anaphylaxis in the most extreme cases. But whatever the reaction of the human, the fact remains that damage is taking place to your reputation & income stream. Identifying & confirming or negating an alleged source of infestation is your number one priority. When you know where they are, you can nullify the problem with planned and discrete action. This means a minimal effect of revenue stream & reputation. Being able to deflect a compensation claim is also as important. This is where the Bedbug Detection Dog comes into its own. Why use a bedbug detection dog? A bedbug canine can check a large area in a far quicker time than a human expert thus reducing man hours and associated cost. A trained dog is able to pinpoint the location of an infestation where bedbugs are suspected but cannot be seen. A dog can be an aid in establishing whether the control/extermination of bedbugs has been successful. 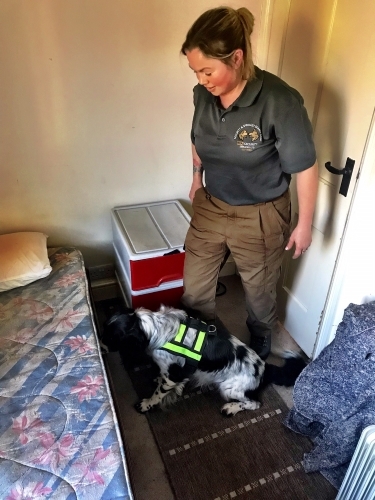 Training with the dog and handler (the team) is carried out regularly in a variety of venues and with differing amounts/sexes of bedbugs, so that the dog learns to detect from one single bedbug, male bedbugs (the females give off a stronger scent so are easier to detect), through to larger amounts of mixed life stages. Our handlers are background checked to the same high standard as our explosive detection dog handlers - criminal record background checked and stringent counter terrorist checks. RFA provide unmarked vehicles for your reputational integrity, full insurance and Non-Disclosure Agreements, (NDA) when requested. ou will find us friendly and professional and we are proud to offer information and expert advice free of charge with no obligation to use our services.